In June 2013, Scenic Hudson conserved 124 acres of beautiful rolling fields, forests, ravines and streams in Green County. 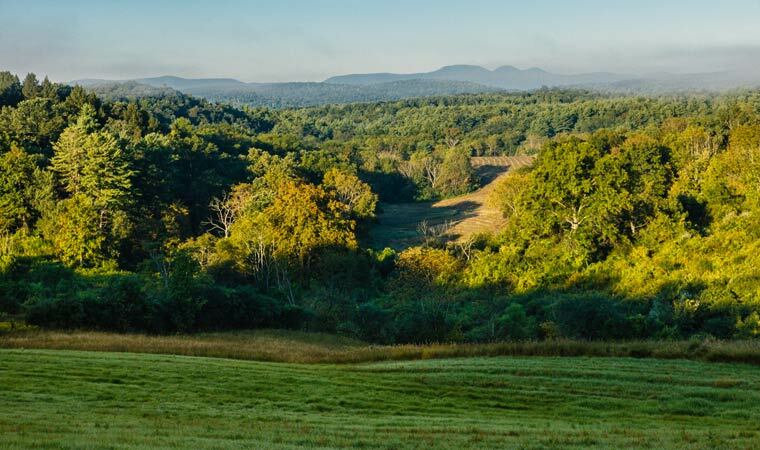 The Hidden Valley property features outstanding views of the Catskill escarpment. Robert Rodriguez, Jr. This spectacular property contains rolling fields, forests, ravines and shoreline along more than 1.25 miles of Sickles Creek and another stream, both of which drain into Coxsackie Creek near its confluence with the Hudson River. A portion of the land is located within a state-designated Biologically Important Area that has receive an A rating, meaning its habitats are considered to be of the highest ecological value. Protected via a donated conservation easement, Hidden Valley contributes substantially to the town’s natural beauty. It forms the foreground to an outstanding view of the Catskill escarpment from County Route 61, a popular location for local landscape painters, and the scenic backdrop to adjacent Otter Hook Farm, on which Scenic Hudson has acquired conservation and public-trail easements. The land also supports the region’s agricultural economy. Portions of it produce feed hay for a local beef herd, with other areas used periodically for grazing. And the easement allows for the construction of two new homes in carefully chosen locations, ensuring the property will continue contributing to the local tax base.